In 1819 the court house of Marlborough District was transferred from Carlisle, a village on the Pee Dee River, to this more central location. 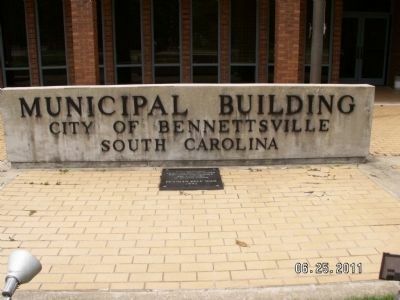 Bennettsville developed around the new court house in the heart of a rich farm land area. On March 6, 1865, it was occupied by the 17th Army Corps, U. S. A., commanded by Gen. W.T. Sherman. Location. 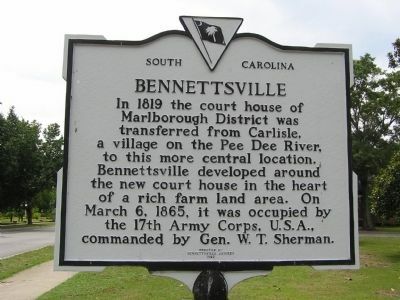 34° 37.169′ N, 79° 40.694′ W. Marker is in Bennettsville, South Carolina, in Marlboro County. 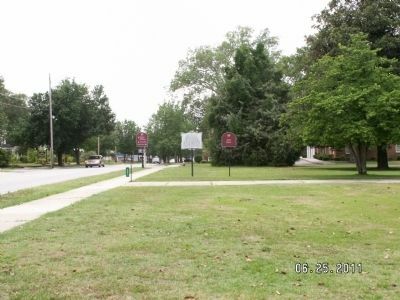 Marker is on East Main Street, on the right when traveling west. Touch for map. Marker is located in front of City Hall. Marker is at or near this postal address: 501, Bennettsville SC 29512, United States of America. Touch for directions. (approx. 0.4 miles away); J.F. Kinney House / P.M. Kinney House (approx. 0.4 miles away); Confederate Civil War Monument (approx. 0.4 miles away); Edward Crosland House (approx. 0.4 miles away). Touch for a list and map of all markers in Bennettsville. More about this marker. 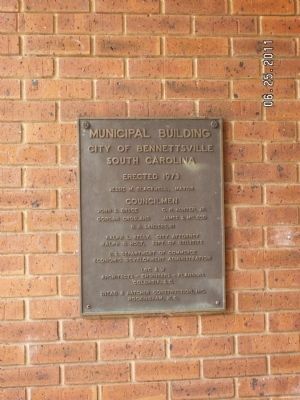 This was the original marker entitled Bennettsville. 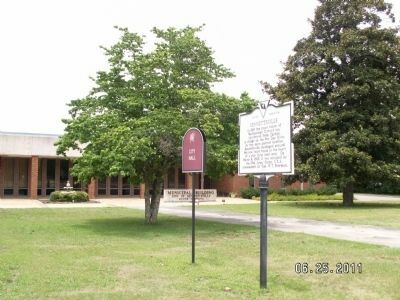 Another marker of the same title was erected by the Marlboro County Historic Preservation Commission, 1980, in front of the Marlboro County Court House. On the grounds of the Bennettsville City Hall. 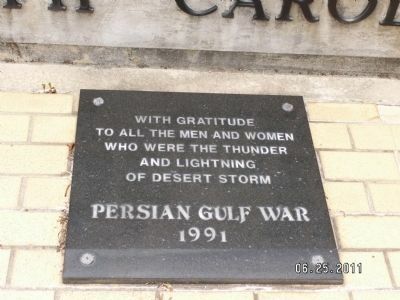 "With gratitude to all the men and women who were the thunder and lightning of Desert Storm" "Persian Gulf War 1991"
More. Search the internet for Bennettsville. Credits. This page was last revised on June 16, 2016. This page originally submitted on September 25, 2011, by Anna Inbody of Columbia, South Carolina. This page has been viewed 411 times since then and 5 times this year. Photos: 1, 2, 3, 4, 5, 6. submitted on September 25, 2011, by Anna Inbody of Columbia, South Carolina. • Craig Swain was the editor who published this page.